One of the most well-known works in the Tate collection, Roy Lichtenstein’s Whaam! 1963, will go on display at Tate Liverpool from 5 February as the gallery marks the start of its 30th anniversary year. 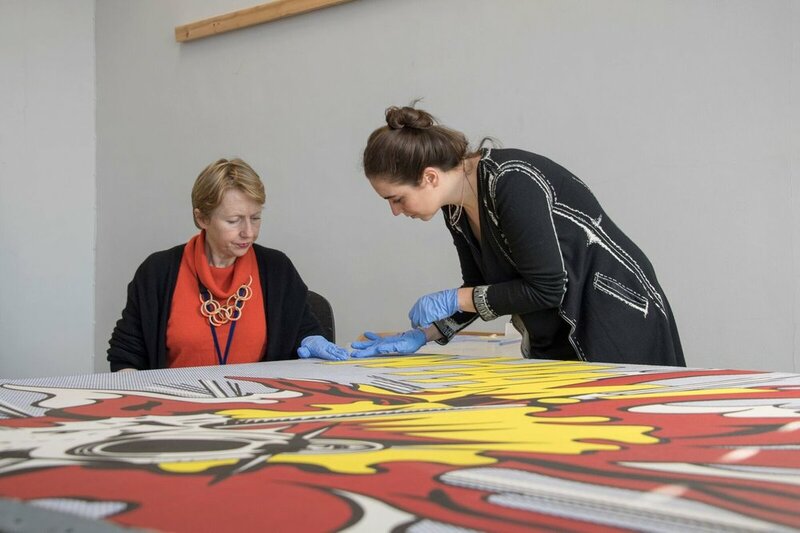 The painting has recently undergone ground-breaking conservation using a newly discovered technique which has brought Whaam!’s colours and design back to life. Due to the popularity of Lichtenstein’s Whaam! the painting has been on almost constant display since it was acquired by Tate in 1966, making it one of the first artworks of its generation to require conservation. The Tate conservators and scientists spent months trialling and evaluating different techniques and options on how to clean the painting. They worked closely with scientists from CSGI (Centre for Colloid and Surface Science) in Florence Italy on materials that will take the conservation of modern artworks into the 21st Century. In collaboration with Tate staff, the CSGI scientists have developed a new gel based on nanotechnology called Peggy 6. The new gel provides greater control in cleaning a painting. It has been produced through a Horizon 2020 funded research project, Nanorestart. The materials used to create Whaam! are characteristic of contemporary artworks; unvarnished and unglazed and comprise acrylic solution paint and oil paint on an alkyd-primed canvas. These materials can prove challenging in modern paintings as each paint can respond differently to commonly used cleaning materials. Bronwyn Ormsby, Principal Conservation Scientist at Tate said: “The research, analysis and scientific evaluation required for a complex large-scale treatment such as Whaam! has involved hours of painstaking work and sustained collaboration across specialist teams. The greatest reward is seeing Whaam! revived." The Tate conservation team was led by Principal Conservation Scientist Bronwyn Ormsby with Paintings Conservator, Rachel Barker and Conservation Science Researcher Angelica Bartoletti.